Jonathan Rea will be hoping to maintain his outstanding record at Assen this weekend as the World Superbike star tries to reel in runaway championship leader Alvaro Bautista. After the first three rounds, Rea is 39 points adrift of the Aruba.it Ducati rider, who has won the first nine races in a row to make a dream start to his maiden season in Superbikes. 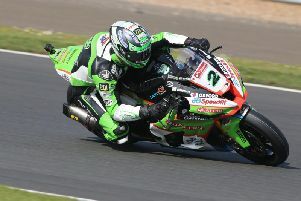 Kawasaki rider Jonathan Rea has finished second behind Alvaro Bautista in the first nine races of the season. Ulsterman Rea has finished as the runner-up each time on his Kawasaki behind the Spaniard, but the Dutch TT is a race the 32-year-old will feel presents his best opportunity yet to turn the tables on the new pretender to his throne. Rea, who has won 12 times at Assen – including eight wins from his last 10 races at the ‘Cathedral’ – said: “We are going to Assen next and we will keep working. It is a track that I have been good at before so but hopefully we can eat into that gap that has been there in the first three rounds. “I used the harder front tyre at the previous round and we really need to evaluate if that is the way forward for my riding style or not. Following the Assen round, the championship will break for a few weeks, resuming again at Imola in Italy over the weekend of May 10-12.